Last month, we celebrated my parents' 61st birthday bay having lunch with my siblings and swimming in the village pool after. My sister brought this towel for my niece to use. Apparently, it's a gift from the States. I found it so cute that even Rap had his picture taken wearing it even when it's already too small for him. 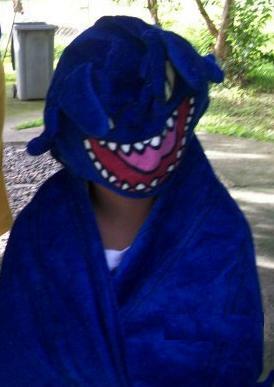 I've started searching for this towel or something similar last weekend at the SM Megamall sale but to no avail. I so want to buy a few pieces to give as gifts. I'm running out of unique christmas gift ideas and I don't want to be the boring ninang who always gives books at Christmas, hahaha! Do you know where I can find this kind of towel? I have same exact one you can buy if you are still interested.